It's summer. Which means hot weather (except here in Cleveland, apparently), grilling out, and beer drinking. I can't say that I'm really a fan of any of those things, but I try to be a good sport. Growing up as a vegetarian, I remember my mother making food on a little bitty charcoal grill maybe once every other year. I can't say that I remember enjoying anything that came off the grill, so as an adult, I never even gave a second thought to grilling anything myself. Until I met my meatatarian boyfriend. He's the kind of guy that bundles up in ski clothes and grills in the middle of winter. To humor him, and to experience a cooking method other than microwaving, I've been searching for the perfect, grill-a-ble veggie burger for years. And I think I've found it. 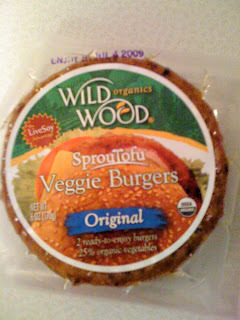 The Wild Wood SprouTofu burger. This is probably the best tasting veggie burger I've ever eaten. And considering that I've been a vegetarian for my entire life, I've tried plenty of burgers, and none of them could compare with this kind. 1. It's not dry. Most of the burgers I make end up drying out and turning into little burnt soy cakes. El yucko. This one, as mentioned above, is a little oily to begin with (which is probably why it has 170 calories and 12 grams of fat), which helps to lock in the flavor. 2. It doesn't taste healthy or like sawdust. 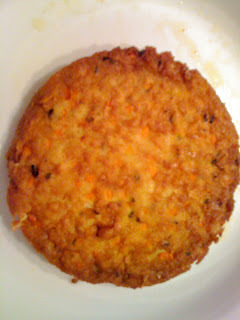 If you've eaten more than one veggie burger, I'm sure you've had a sawdust burger. So many veggie burgers are bland and boring. This one is seasoned with onion and garlic and tastes like something you'd want to eat. 3. It's made with sprouted tofu. I can't be certain of this one, but the tofu in this burger has a nice consistency. Not chewy, not flaky - just right. Although a bit fattier than I'd like it to be, I'd care to bet that this burger (cooked on foil, far away from your meatatarian friends' food) would be a great addition to a vegetarian's grill options. It's so good that your meat eating friends might even be jealous of your meal...well...maybe not, but it is really good.